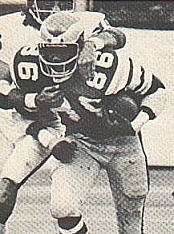 An All-American in college, Young was the second of two first-round draft picks (sixth overall) by the Eagles in 1973. The outspoken rookie moved directly into the starting lineup and backed up his words with production as part of the “Fire High Gang” along with tall wide receivers Harold Carmichael (6’8”) and Don Zimmerman (6’4”). Eagles went 5-8-1 to finish third in the NFC East while leading the NFL in passing offense (2998 yds.). Young followed up his outstanding rookie season by gathering in a NFC-leading 63 catches for 696 yards (11.0 avg.) and three touchdowns in 1974. He was again selected to the Pro Bowl in 1974 and ’75, although his production dropped with the offensively-challenged Eagles in 1975 and ’76. His first name also went through several different changes, from Charles to Charlie, Charli, and finally Charle. A contract dispute forced the trade of his rights to the Los Angeles Rams in 1977 for QB Ron Jaworski, and he dropped into obscurity behind Terry Nelson. In three seasons in LA, he caught just 36 passes. Moving on to San Francisco, Young was a better fit and, in the 1981 Super Bowl-winning season, had 37 pass receptions for 400 yards and five TDs. Following three years with the 49ers, he finished up with three seasons with the Seattle Seahawks. For his 13-season career, Young caught 418 passes for 5106 yards (12.2 avg.) and 27 touchdowns and was selected to the Pro Bowl three times.